I regularly defend folks who are charged with DUI in Virginia. Our criminal justice system depends upon criminal defense lawyers fighting hard to limit the government’s reach and protect individual rights. At the same time, I recognize that DUI is a serious offense that can result in fatalities. Based on data from the CDC, we know that Virginia sees nearly 300 drunk driving deaths annually and that nearly 100,000 people admit to driving drunk every single month. We wanted to know whether there are specific parts of the state where you’re significantly more likely to be hit by a drunk driver than others. Given their size, it is obvious that Virginia’s largest counties/cities like Fairfax County, Prince William County, and Virginia Beach experience the most total drunk driving crashes and deaths. However, when you look at the numbers on a per capita basis, the results are surprising. 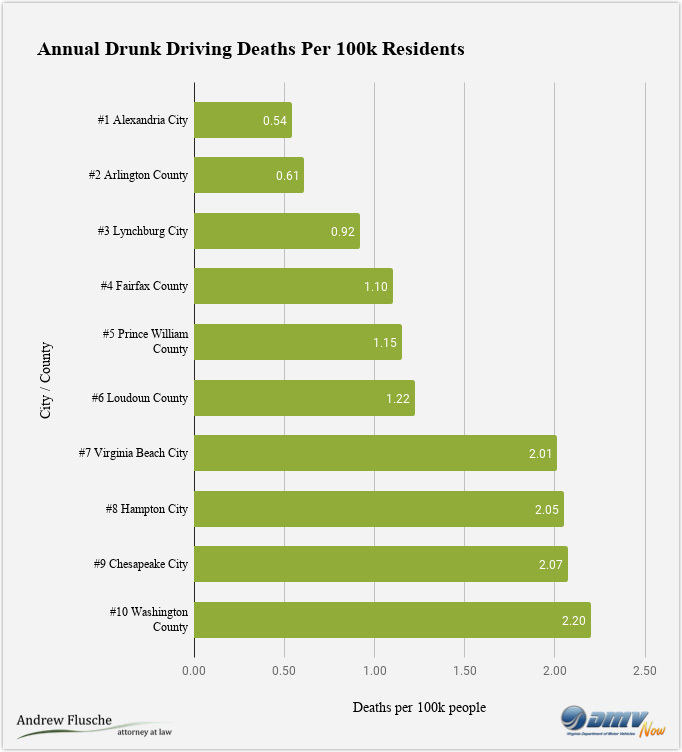 Based on the last five years, we have ranked the top 10 most dangerous counties and cities in Virginia based on drunk driving fatalities per 100,000 people. For complete details on the methodology used to rank these counties/cities, click here. 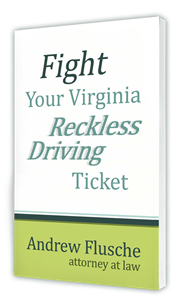 To see a list of the Virginia cities/counties with the fewest drunk driving deaths per capita, click here. Pittsylvania County tops our list of the most dangerous places in Virginia for drunk driving. Pittsylvania county is on the border of Virginia and North Carolina. Despite a relatively small population of just over 60,000 people, there are 60 drunk driving crashes annually. Each year, almost 6 of these crashes result in fatalities, and 36 result in injuries. The number two county on our list is Henry County, just one county over. Henry County has the smallest population on our list, at just over 51,000, and is home to 63 annual drunk driving crashes. Drunk driving crashes in Henry County result in 4 fatalities and almost 50 injuries each year. Drive 175 miles North and you will arrive at the third location on our list, Rockingham County. This county is home to James Madison University, and with a population of almost 80,000, it sees almost 100 drunk driving crashes annually. Each year, these crashes account for an average of 6 deaths and 55 injuries. One county to the Southwest is Augusta County, the fourth county on our list. This county borders West Virginia on one side and Charlottesville on the other. Augusta County sees about 85 drunk driving crashes annually, which result in 5 fatalities and 50 injuries. 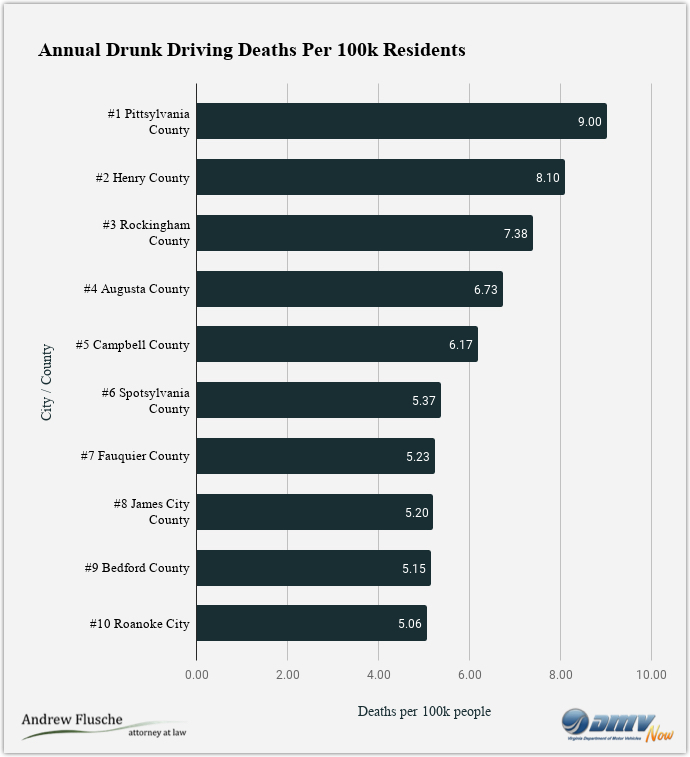 Campbell County—the second smallest county on our list—has a population of 55,000 and the fifth highest drunk driving fatality rate in the state. Located in Central Virginia, this county is home to 65 drunk driving crashes per year, with 46 injuries and 3 fatalities. Our home jurisdiction of Spotsylvania County comes in number six on our list. Just South of Fredericksburg is the largest county on our list, with 130,000 people. Spotsylvania County has 125 drunk driving crashes per year. These crashes result in 80 injuries and 7 deaths annually. Another nearby county in the Washington metro area is Fauquier County, home of almost 70,000 people. Fauquier County is the site of almost 100 drunk driving crashes annually, which produce 4 deaths and 70 injuries. Head South and you will find the eighth county on our list. James City County borders the city of Williamsburg and has a population of 73,000. The county sees 47 drunk driving crashes each year, along with 33 related injuries and 4 fatalities. Just North of the number one county on our list is where you will find the ninth highest rate of drunk driving fatalities in the state. Bedford County—in between Roanoke and Lynchburg—has a population of 78,000 and 77 drunk driving crashes per year. Those crashes result in an average of 4 fatalities and 63 injuries. Rounding out our list at number ten is Roanoke. The only city on our list has a population of 95,000 and is one of the larger cities in Virginia. Roanoke is the scene of almost 100 drunk driving crashes, 43 injuries, and 5 fatalities on an annual basis. Using Virginia’s Traffic Records Electronic Data System we obtained county and city crash data for all Alcohol Involved Crashes (ie. drunk driving crashes) over five years, from 2013 to 2017. We narrowed the list of counties and cities down to only those with a population of over 50,000 people. We calculated the average number of drunk driving fatalities per year, per city over the five year span.